SOL Organics bedding is made with ultra soft long staple cotton (which is 100% certified organic). Sol Organics sheets are made from the finest non-GMO long-staple cotton seeds from India producing a soft, durable fabric. These sheets are really soft, have luxurious feel and come in 6 beautiful colors with amazing stitching. 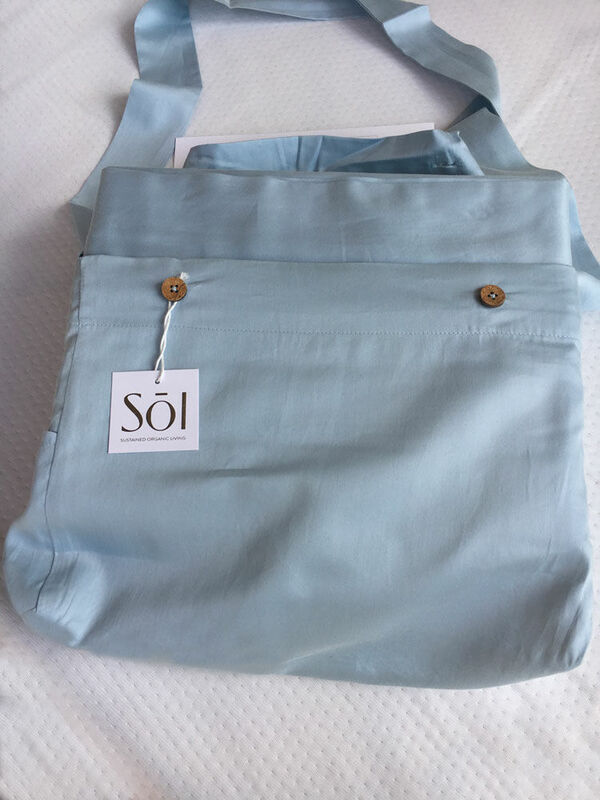 SOL which stands for stands for Sustained Organic Living – is committed better prices, decent working conditions, local sustainability, and fair terms of trade for farmers and workers in the developing countries – Fair Trade Certified. Certified Fair Trade Organic and ethically made from seed to sheet is the company commitment. SOL Organics does its best to eliminate all chemicals and unethical working conditions from the production of its products. On opening there is no noticeable odor or chemical like smell at all. You do not have to air these sheets outside. 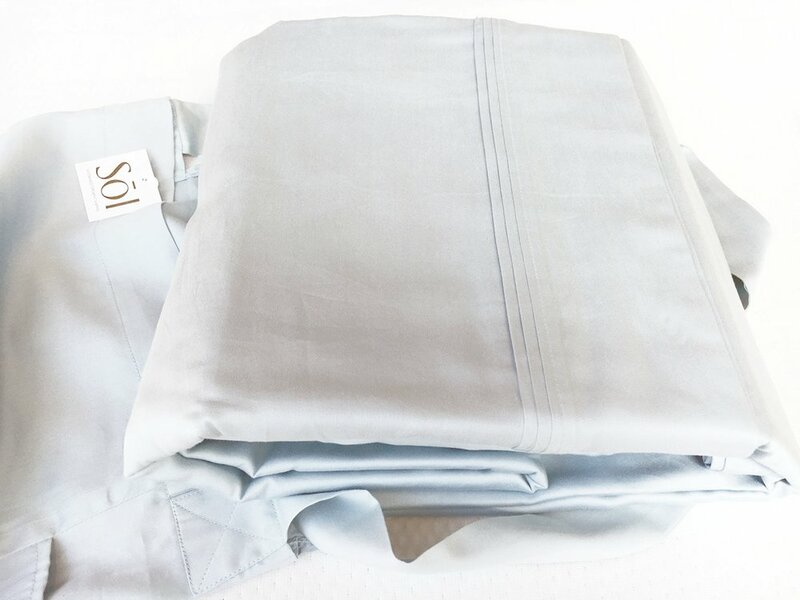 Your luxury organic sheet set will arrive in a cute re-usable organic bag in the same color as your purchase. Plus the bag makes these sheets a perfect gift. SOL offers a 30 night in home trial for their sheet sets. If you don’t love them you can return them and get a full refund. SOL Organics ships your purchase for free via FedEx Ground so they arrive quickly in 2-6 days. GOTS Certifies: that the entire supply chain from seed to sheet (processing, manufacturing, packaging, labeling, trading and distribution) is environmentally and socially responsible. The organic cotton is grown in Chetna Organic Farms, Central India. SOL Organics Sheets are made in their Fair Trade-certified factory, where workers are treated with dignity and respect, and without any child labor or forced labor used. SOL uses only the finest Fair Trade Certified organic cotton that has been grown from non-GMO cotton seeds supporting their seed to sheet commitment. SOL Organic Sheets are really soft, and have a sateen shine. SOL uses a sateen weave that is designed to improve breath-ability, cooling, and feel. They are light, airy and they have a relaxed wrinkle but not too crumpled look. The sheets are extremely soft to touch even after washing. Very Comfy! All sheets have a 300 thread count and come in a selection of 6 colors: White, Blue, Ivory, Dove Grey, Sand & Steel-Grey. We washed the set 6 times and they got softer with every wash, no loose threads, no piling. There was a small amount of shrinkage after the first wash but that was expected. The fitted sheet still went on the bed smoothly with plenty of room to cover the 15” DreamCloud Mattress we tested on. The SOL Sheet Set comes with a fitted and a flat sheet + 2 pillow cases. The sheets are available in twin, twin XL, full, queen, king and cal-king. You can add a duvet cover and extra pillow cases. A set starts at $99 for a twin, $159 for a queen set. SOL organic Sheets are sized to fit up to a 17” mattress. Extra care is required for all organic cotton made products. Wash and dry bedding in cold water only without mixing with other items. Use only a small amount of laundry detergent to keep from breaking down the fabric. Avoid bleach, fabric softener, detergent and chemicals. Dry sheets on low & try not to over dry. Organic sheets will have a more wrinkled RELAXED look rather than crisp. These organic sheets are extremely soft, comfortable and have an attractive look. The sateen weave provides a stylish shine and is cool to the touch. The six available colors offer a range to mix and match with quilts, duvet covers and blankets. SOL Organic bedding is 100% organic cotton and supports fair trade. the name SOL stands for Sustained Organic Living. SOL sheets are luxury but very competitively priced compared to other organic sheets - check out pricing below. The Sateen weave provides a slight shine that is an attractive look especially with the pleated option – great detail on the stitching. The sheets are soft, comfortable and durable. Who Should buy SOL Organix Sheets? People looking for sheets made of organic cotton & support fair trade practices. Those who want a natural luxury sheet with detail stitching at an affordable price. People looking for sheets that will sleep cool. Individuals who appreciate a quality product with a relaxed look. SOL Organix’s Queen Set is $159 for fitted and flat sheet + 2 pillow cases. We Loved this Product and admire their commitment to their mission. ─ The SOL Organix Sheet Set offers a high quality organic option from a company that is totally committed to fair trade practices. We recommend the SOL Organix sheets because they are soft, comfortable and look expensive, but feel great. A big plus is the no chemicals and no harm to labor dedication from the company. Kudos!